The following guest post, comes from a new friend and fellow ally on the ether Anegelica Amesquita-Carter. We connected most recently after a series of comments on the Ethnicity and Place series made it clear that her West Coast version of being a new TRA parent might have many points of overlap and ah-ha to our readers. Over two years ago, D and I started our journey like a lot of hopeful adoptive parents, we wanted a baby, any baby, I’ll take him or her or them or… You get the picture. We knew we could love a child without their image being a reflection of our own. We took our adoption classes very seriously, and enrolled in a transracial adoption class to learn what it would be like to raise a child of color. While it covered the facts – information packets neatly stapled in piles and a few adoptive parents and adoptees sharing their stories – nothing prepared us for the journey but life itself. When our baby finally arrived, all of our time and energy was spent nurturing and fussing and building the beautiful life we wanted to make for him. Family and friends began trickling in and making appearances to greet our son, and to our surprise, this is when things started to get tricky. Inappropriate questions and curious probing about his birthmother and his story came without warning.While we were slowly getting used to questions, stares and puzzlement in the eyes of strangers, we thought we’d find support and strength in our small circle. But it wasn’t that simple. One particular moment I won’t forget was at a big family wedding, the first time our nine month-old son was introduced by his great-grandmother to other family and friends. She presented him as her “adopted great grandson.” Instantly I wondered what made her feel the need to state the obvious. Was she ashamed, or did she just want to make it clear in case someone may have misunderstood? It broke my heart, and yet I was unable to say anything. Now our baby is fast approaching two, and this boy does not miss a beat – he hears everything, and he feels the vibes of sticky situations and tricky confrontations. To help handle the inevitable encounters to come, I sought out more resources and took a day-long transracial workshop through an organization called PACT. It was the first class that honestly revealed the true meaning of transracial adoption from all perspectives. The personal testimonials and insightful teaching, combined with our now numerous real-life experiences, opened up my heart and mind to the realities in a way that the first class couldn’t. Afterwards, I was spinning from all I had learned and needed to share it. Around the same time, I read a blog post from Mama C where an adult adoptee had posted his take on being a transracial adoptee. His eloquent story echoed what I had heard three adult adoptees state in the class, and I knew then that I wanted to forward it to both of our families, and so I did. Sadly, I never even received a simple acknowledgment of the hopeful email I had sent. Later in the month we took a trip to visit D’s parents. As always, they were excited to see him, gave him lots of love and attention and we were having a great time together. And then we started talking. D excitedly mentioned an encounter at our local cafe where I had talked about transracial adoption with a stranger. 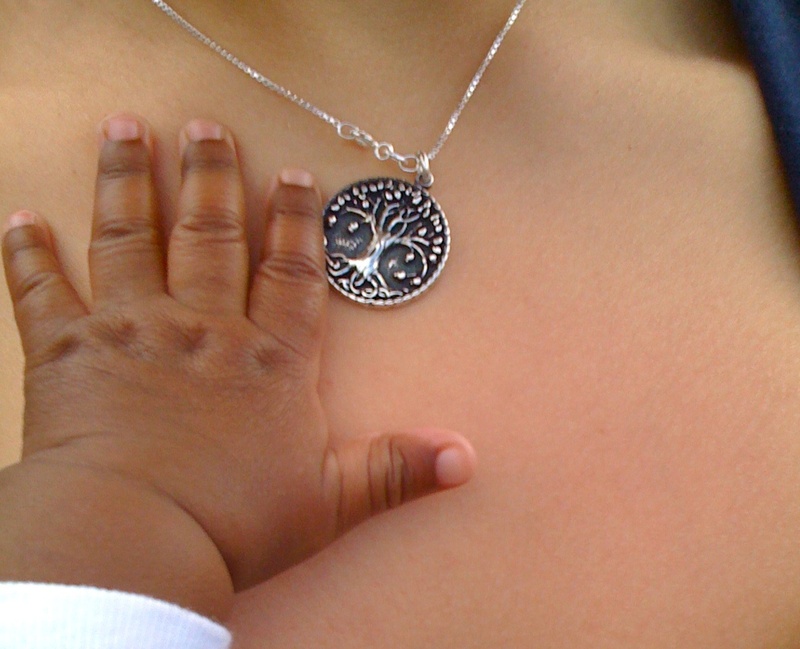 It had been an amazingly honest moment of sharing what it means to be the parent of an adopted African American child. At the end of the conversation, he had actually thanked me for opening his mind to a new way of seeing adoption, and that he’d never be the same. It was one of those positive moments that we all look for, and D wanted me to share it. As his mom and I sat together and I told her the story, somehow it turned to the topic of our ongoing concern about where exactly to raise our son, and what would be right for him as he grows older – all the usual parental worries, but with a transracial adoptive angle. Finally, for the first time, D’s mom said openly that she was baffled by our desire to always bring up race and that it actually didn’t matter at all to her and she was concerned that we were going to give our son some sort of “complex” as he gets older by bringing it up or being overly-concerned. I couldn’t help thinking, “This, my friends, is White Privilege 101 at work.” It was the familiar “colorblind” argument, the discomfort that some of us have in admitting that race is a real thing, not a bad thing, just real, and a factor in everyday life. So while I understand where she was coming from, it was hard to hear. Because even after patiently explaining the ins and outs of what it means to be him, and a transracial family, somehow the point was missed. In moments like these, I always try to remember that not saying anything is like saying you agree. Just as the woman in the grocery store was reaching out to us for her daughter’s sake, I reach out to people now in the interest of my son, no matter how awkward it may be. She taught me that it’s our job as adoptive parents to advocate for our children, and to turn unsettling conversations into teachable, positive moments. I never expected that the best lesson I would learn wasn’t in a book or a class, it was in a grocery store, from a complete stranger who cared and understood. It was like meeting myself, 16 years from now. Angelica Amesquita-Carter is a transracial adoptive mother (and personal assistant/stylist) of a lively toddler. Before landing her dream job of being a full-time mom, she was a make-up artist for over a decade. Born and raised in Los Angeles, she lives with her husband and son in San Francisco. Her passions include music, adoption, and adventure-hunting with her son. I was just thinking about ways of talking with white family about parenting a child of color. (I’m not yet a parent, but am working my way though the journey of getting there, and TRA may be a part of that.) It seems to me that one of the ways to help a transracially adopted child navigate experiences of racism is, of course, to believe them every time they indicate they have experienced it. Our white relatives and close friends in the child’s life might not be used to that, though, saying well-intentioned but harmful things like, “Oh, I’m sure X didn’t mean that” etc. I’d be interested to hear, Catherine, how you’ve handled these kinds of situations or how you’ve talked with family and caregivers about handling Sam or Marcel’s encounters with the wider world. It is a great question. I find that what I do most consistently is to talk about things at home in as easy going a normal way as we can. I model my own disdain for ignorant comments, and how I would respond. I have these conversations with friends and their kids too.We brainstorm. For us now anyway, it is about creating comfort with the topics. My hope is that this will help both boys be hyper aware and comfortable in their own dialogues on the topic. If I hear things in passing, or on a program–we talk about it. Finding our own comfort on the topic is so critical. I look forward to hearing other responses too. Thank you for mentioning how early your son was aware of the tension and discussions. So many people want to think they “don’t understand”. Also, I LOVE your necklace. May I ask where you got it? Hi, thanks so much for reading my post. It’s amazing how people dismiss the abilities of the awareness of our children. They don’t miss a thing and my little guy is especially sensitive to his enviroment. Angelica: I too live in San Francisco with an almost two transracially adopted son seeking adventure! Mama C: thank you for your blog. Seriously. Feel free to share my email address with Angelica if she wants. Angelica, thank you for your post and Momma C, thank you for sharing it! Being ready all the time with something witty or educational puts you on edge – I am sometimes afraid I am “reading into” what people are saying, or thinking (my son is incredibly cute lol proud momma – maybe they are looking at us because of that) or are they thinking something more sinister. …..and of course sometimes I just want to say “dude, that was stupid – why would you say that? Working with my family is a challenge sometimes because they want to be color blind because they think its the “right” thing to do, or they are too uncomfortable with the conversation – we will continue to work at it. I appreciate hearing from other families and learning from their experiences. Yes, I too appreciated this post. Because of all the education and training we got, sometimes I do have to wonder if I’m reacting due to my hypervigilance or to there really being something there. Not obvious comments, but for example there is a woman who is IN. LOVE. with my kids – esp my two beautiful brown almost-adoptive kids. In. Love. And I got all kind of feeling weird about it….but it really may just be that she has a connection with them. Hard to sort through how to approach it.